To meet the requirements of the French 1930 fighter programme, Andre Herbemont evolved the Bleriot SPAD 510. 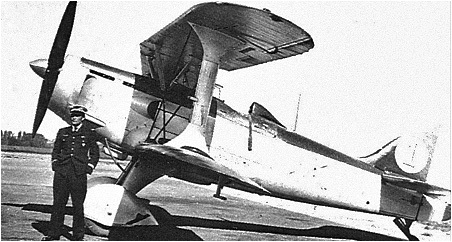 The Type 510, which was ordered as a single prototype to participate in the programme, was of allmetal construction with a duralumin monocoque rear fuselage, and fabric-covered wings and tail assembly. Powered by an Hispano-Suiza 12Xbrs 12-cylinder Vee liquid-cooled engine rated at 690hp 4000m, the Bleriot SPAD 510 was flown for the first time on 6 January 1933. After protracted evaluation, during which the centre fuselage was lengthened by 40cm to rectify a shortcoming in longitudinal stability and the vertical tail surfaces were enlarged to improve yaw characteristics, the type was ordered into production in August 1935. The first of 60 production examples were delivered early in the following year, the final two aircraft being accepted with the HS 12Xcrs engine and a 20mm Hispano-Suiza motor cannon. The standard armament comprised four wing-mounted MAC 1934 7.5mm guns. The Type 510 proved to be the last fighter biplane to be ordered for the Armee de l'Air.